Choking is blockage of the airway due to food or other foreign objects getting stuck in the airway, thereby obstructing breathing. All incidents of Choking should be evaluated by a trained medical professional, as soon as possible! DO NOT wait! Failure to obtain evaluation as soon as possible may result in serious injury or death. Call 911 (or your local emergency number) immediately, if you experience Choking. What are the Causes of Choking? Choking is caused when food or other small objects get stuck in the airway, causing obstructed breathing. What are the Signs and Symptoms of Choking? How is First Aid administered for Choking? 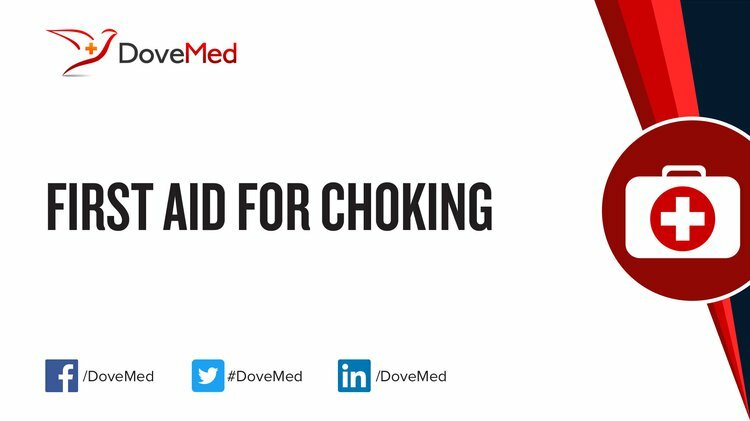 Who should administer First Aid for Choking? A person near the individual, who is choking, must administer First Aid immediately. What is the Prognosis of Choking? The prognosis is dependent on how quickly the object is cleared from person’s airway, since an obstruction for long periods will result in a reduced oxygen supply to the brain. With timely help, prognosis is generally good. Bánfai, B., Deutsch, K., Pék, E., Radnai, B., & Betlehem, J. (2015). Accident prevention and first aid knowledge among preschool children's parents. Kontakt, 17(1), e42-e47. Thomas, J. J., Brigham, K. S., Sally, S. T., Hazen, E. P., & Eddy, K. T. (2017). Case 18-2017—An 11-Year-Old Girl with Difficulty Eating after a Choking Incident. New England Journal of Medicine, 376(24), 2377-2386. Baig, A., Thomas, H., Britigan, D., Finken, D., & Colombo, J. (2016). Food Choking Hazards in Toddlers: An Interventional Study. CHEST Journal, 150(4_S), 968A-968A. Sheppard, J. J., Malandraki, G. A., Pifer, P., Cuff, J., Troche, M., Hemsley, B., ... & Hochman, R. (2017). Validation of the Choking Risk Assessment and Pneumonia Risk Assessment for adults with Intellectual and Developmental Disability (IDD). Research in Developmental Disabilities, 69, 61-76. Pavitt, M. J., Swanton, L. L., Hind, M., Apps, M., Polkey, M. I., Green, M., & Hopkinson, N. S. (2017). Choking on a foreign body: a physiological study of the effectiveness of abdominal thrust manoeuvres to increase thoracic pressure. Thorax, thoraxjnl-2016. Lumsden, A. J., & Cooper, J. G. (2016). The choking hazard of grapes: a plea for awareness. Archives of disease in childhood, archdischild-2016. Gregori, D., Rosati, L., Baldas, S., Lorenzoni, G., & Rodriguez, H. (2016). 179 How to prevent choking injuries in paediatric ages. Cheng, E. R., Bauer, N. S., Downs, S. M., & Sanders, L. M. (2016). Parent health literacy, depression, and risk for pediatric injury. Pediatrics, e20160025.